Well that a difference one week makes! This past week Dillon's strength in this arms has grown a lot more. He has been having little muscle reactions to his therapy in this ankles! Also during one of the acupuncture treatments this past week Holly told me the needles were "twitching" per say...(excuse my lingo I am not medical minded!) in the knee area as well. They said that the muscles are likely trying to react to the brain signaling to 'move' and thus the little muscle movements! This is huge news! Although it is baby steps...each little step helps along the way to his recovery. This next week is a big week as well because Dillon will get to make small trips outside the hospital. Holly will be able to take him on a few small outings. They won't be gone too long at a time but this is good practice on getting in and out of the vehicle. How nice for him to be able to leave the hospital for a few minutes during the day! I am sure the walls of the hospital can get boring. 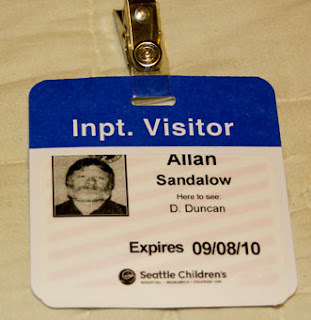 The days at Seattle Children's seem to be pretty action packed with the specialist, residents, nurses, physical therapists and everyone else that comes to work with Dillon during the day. Holly said they always seem to be working on something or moving somewhere throughout the day. Dillon is such a trooper doing everything he possibly can to help with his recovery. Can't wait to hear new news this next week. Well the last couple days have been a bit rough for Dillon. When he moves to his wheelchair the blood seems to be draining away from his head down to his feet, so he gets dizzy and light headed easily. From what I have read people with spinal cord injuries can have lower blood pressure as a result of their injuries with blood flow etc. (Remember I am not a doctor so I may not be stating this correctly).This is frustrating for Dillon not feeling good when he was just starting to feel more mobile with the small trips in and around the hospital. They are continuing with therapy as planned but it is a bit tough when his overall feeling of health is down. OK, next time I'm holding out for a better picture. I had a chance to visit Dillon (and Holly) at Seattle Children's Hospital today. The news is basically good. If you have been to Children's, you know what an amazing place it is. Everyone there is there because they have a passion to work with children and youth. They know how to help meet not just the medical needs of their patients, but their emotional and social needs as well. As I visited Dillon today, Holly was meeting with a psychologist who will work with Dillon and a coordinator who will set up a school program for him. He will be well taken care of. Dillon was his old self. He looks good. He's as bright and articulate as ever. If you didn't know about his healing pelvis and lack of feeling, you'd have no idea anything was wrong with him. I found he had also followed and understood what the doctors had told him (no small task for anyone). He still has no feeling from about the middle of his torso down, but the anticipation is still that once the swelling in the spine subsides, feeling will come back. He is equally aware that when it does, he will need to re-train all the muscles that have been affected – something that could take not just weeks or months, but up to 1-2 years. He started physical therapy today. The frustrating part of that for him is that what they are mainly doing to is to show him how to use and get around in a wheelchair. They have to start where he is at. He defiantly told me "Leaving here in a wheelchair is not an option!" I was glad to hear that spirit and determination. He will need that in the weeks to come. Continue to keep him and his family in your prayers. God is good. Dillon could have been killed in this accident if the truck had landed six inches further up his body. Let's pray that the miracle will continue and he will be restored to full health.